If you haven't heard, CCP is holding a poster contest for Eve Vegas. I encourage everyone who wants to enter to do so. I have entered two posters of my own, the first of which is above. I'll be releasing the other one publicly later. Long time readers may be surprised to hear that I am entering this contest. As is typical of these CCP contests, you are essentially giving over all rights to your work forever and ever. However, seeing as that work is rife with CCP IP Trademarks - there are truly no other options available. If you want to do art based on Eve IP then these contests are it. As I have discovered over and over again, CCP has zero interest in working outside of whatever arcane, ever-changing, adaptable, fart-in-the-wind system they have at the moment. Which is fine. As I've said thousands of times before and will probably say a thousand times again - it is their IP to do with as they please. As for me, I just want to get my work into the player's hands. Mostly that means creating awesome swag to give away at player events like Fanfest, Steel City Eve, and Eve Vegas later this year. But often it means taking advantage of opportunities when they present themselves. Like a poster contest. All of which doesn't mean anything. I might not win, or I might come in second or third and not get a poster printed for Vegas. Or I might win and CCP change its mind about printing them for Vegas. Goodness knows that has happened to me before. Twice. Chance. There are a lot of very talented creatives in our community and I look forward to seeing the other entries. Best of luck to everyone that enters. And I mean that sincerely. Once I decided on the creative for this poster I decided that the best way to present it would be to create a style that captured the look of old screen printed limited color propaganda posters. To do that I decided to work entirely in Adobe Illustrator to create the art. I actually illustrated two Drakes in two different styles before I finally landed on the final look I was after. I hope to use the other one in another project down the road. 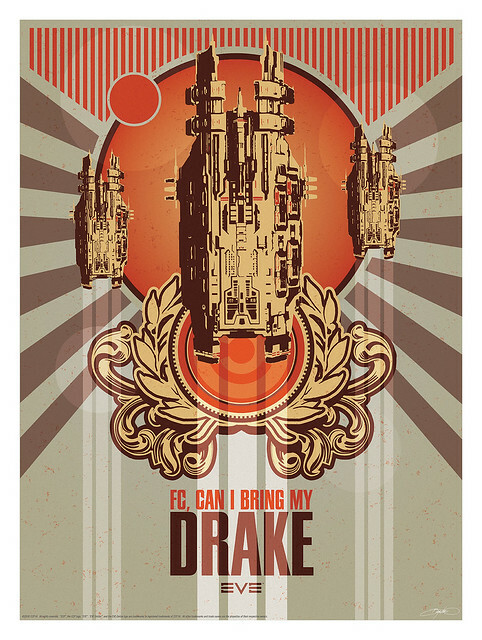 The final Drake was probably the easiest spaceship illustration I've ever done for a final project. It only includes three colors, which made it pretty easy to create. The final poster is actually four-color, the limited color palette is only a "style" and not an actual treatment. Which I think helps to modernize the look, which is what I was hoping for. This was not my first design for this poster, in fact I probably did about 8 different thumbnails and eventually decided to just work it out in real-time. The graphic elements are re-used from beer labels I designed years ago, altered of course. My habit of never throwing anything away comes in handy. And that helped to keep the total time spent on this poster down to about 8 hours from start to finish. Whatever happens with the contest, win or not win, I'm happy with the end result. It is yet another example of what I believe is an endless well of largely un-tapped Eve based creative that could be used to help sell Eve Online to a much larger gaming community. And that, as always, has been my goal since day one. Tomorrow I'll show you the other entry. Which is completely different.